standardization status, and strategic market considerations. Relevant issues include e.g. whether a user organization backs the ongoing development of a protocol, whether a protocol is classified in the IEC standard, and whether a system is suitable for hard real-time requirements. achieve real-time performance, Industrial Ethernet protocols employ special preventive measures to avoid such collisions. For hard real- time, signal transmission times must stick exactly to a given time frame, or else they will trigger a failure signal. For soft real-time, some deviation within a limited span of time is tolerable. 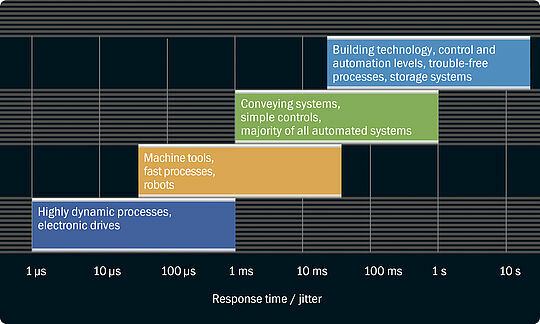 While cycle times of up to several hundred milliseconds may be good enough for soft real-time applications, e.g. for temperature monitoring, digital control systems or Motion Control applications often require cycle times below one millisecond. Another key aspect in selecting Industrial Ethernet systems for comparison was market penetration: various IMS and ARC surveys indicate that about three quarters of all Industrial Ethernet applications around the world use EtherNet/IP, PROFINET, or Modbus TCP. Next in line are POWERLINK and EtherCAT, two systems particularly suitable for hard real-time requirements. The following roundup does not examine Modbus TCP on its own, since its user organization ODVA has stated that it has been integrated into EtherNet/IP. SERCOS III, however, was included for comparison despite its marginal market share, because this system plays a vital role for fast Motion Control solutions.